The Caja is Costa Rica’s public health care system. The full name is the Caja Costarricense de Seguro Social (CCSS). For many expats living here, their experience is limited to getting their carnet (health system enrollment card) at the Social Security office and getting prescriptions or lab tests through the Caja. But in Costa Rica, healthcare really starts at the EBAIS, the local clinic. EBAIS is short for Equipos Básicos de Atención Integral en Salud. In English, it means “Basic Teams of Global Health Care.” The EBAIS is the first level of care in Costa Rica. These clinics provide both primary and preventative health care to all of the individuals in a community. 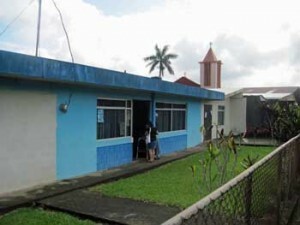 A typical EBAIS serves about 4,500 people, and there are over 1,000 EBAIS clinics in Costa Rica. 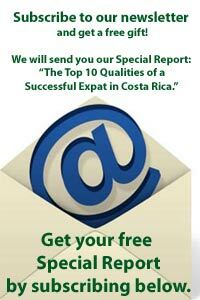 There are 81 cantons (counties) in Costa Rica, and all of them are composed of districts. Each district has at least one EBAIS; some have more, depending on population. The county of San Ramon is composed of 13 districts, one of which is actually the town of San Ramon, where the county seat resides, population 10,500. We go to the EBAIS located in our district, Santiago. Luckily, our EBAIS in Santiago is open three days a week — Mondays, Wednesdays and Fridays. On Tuesdays and Thursdays, the staff travels to other parts of the district. Each EBAIS team is made up of at least a physician, nurse, medical records technician, and pharmacist technician. 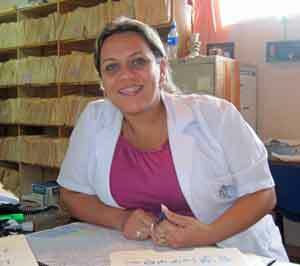 Our EBAIS also has a Técnico de Atención Primaria, a visiting nurse who travels by motorcycle to do home visits throughout the community. Our EBAIS is also staffed by two visiting nurses and, every two weeks, there is also a lab technician on-site to take blood and other samples for analysis. Results are available within another 14 days for review by the doctor. Going to the EBAIS is convenient because it is close to where we live. It makes me feel a part of the community to go to our local EBAIS. Being Expats, we may be somewhat of a novelty at the EBAIS, but everyone greets us with smiles. 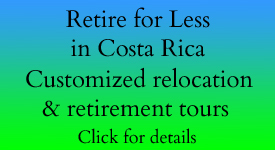 The other patients are curious about where we live and how long we’ve been in Costa Rica. They are very respectful toward us and each other, especially their senior citizens. Every month there are posters and information available on a featured medical condition. One month it might be cancer awareness and another month a focus on the special medical needs of seniors. This is the first time in my life that I love going to the doctor’s. Every time I go, I get a warm and fuzzy feeling because I sit there and watch the families come in – young, old, pregnant, children, everybody in the community. Those with chronic conditions, like diabetes and pregnancy, get seen first by the doctor. There is no phoning ahead for an appointment, unless it is an emergency. The standard procedure for everyone is to show up between 6:30 and 7 am and get in line to see the medical records technician/ receptionist when the EBAIS opens at 7am. She gives you an appointment time for later in the day – first come, first served. Then you go home and return later at your appointed time. The waiting room is plain but clean. There are wooden benches and hand-made signs on the doors. No wallpaper, potted plants and cushy chairs here. It is basic and it works. The money is spent on healthcare, not décor. You wait until your name is called – we usually come prepared with something to read but the wait usually isn’t any worse than in a doctor’s office in the U.S. The first stop is the Nurse’s office to have your blood pressure and weight taken, and to go over the purpose of your visit, as well as any other information needed, with everything noted in your chart. You go back to the waiting area until the doctor calls your name. Usually we are there for about an hour from start to finish. If we have prescriptions to be filled, that takes no more than 10 minutes at the EBAIS pharmacy. We see the same clinic staffers every time we go and they have gotten to know us as well. The atmosphere is relaxed, though professional. We may joke with the visiting nurse and chat with the receptionist about her recent vacation. Often the doctor is wearing blue jeans under her white lab coat, and the whole staff stops for a coffee break together at 9:30am. There are no constantly ringing phones and stressed-out employees. There are no staff members calling insurance companies to check patients’ coverage. People waiting to see the doctor know the system and patiently wait for their turn. All-in-all, it’s usually a tranquilo place. We can visit the doctor on any day the EBAIS is open for current medical problems, however we go at least every six months for the doctor to write our prescriptions for the following six months. At that time, the doctor might also write orders for other medical tests that might be necessary like EKGs, ultrasounds, Xrays, blood tests, etc. If the tests are deemed urgent, they are done quickly, sometimes in a matter of days. But routine tests may take months to get scheduled. Current residency law requires that all residents must join the Caja. However, very few expats actually use the EBAIS system, either because their Spanish isn’t good enough or they don’t understand how it all works. The system can be daunting if you don’t understand it. We certainly didn’t understand it at first. But every time we see the doctor at the EBAIS instead of going to a private doctor, we save at least $50. We both speak and understand enough Spanish to see the Spanish-speaking EBAIS doctor for most things, but if a more complicated health issue arose, we wouldn’t hesitate to see a private doctor who speaks English. 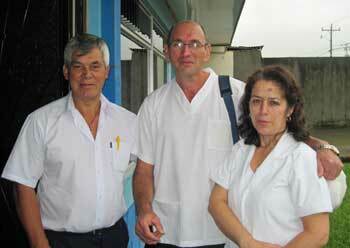 Many of the private doctors are also members of the Caja. 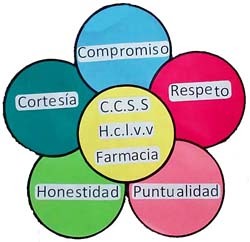 This means that you can see a private doctor for care, and that doctor can then write prescriptions which can be filled in the Caja, and orders for tests that can be scheduled through the Caja too. So, though you pay to see the private doctor, there is no charge for the tests or any of your prescriptions which the Caja stocks. Sometime seeing a private doctor can speed up the referral process and you can, in a sense, jump ahead in the line. 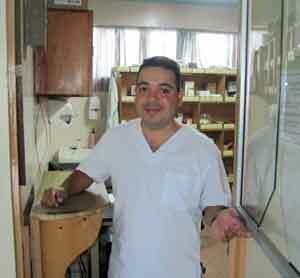 Many Costa Ricans also use a combination of public and private medical care. The visiting nurse visits the sick and also travels to homes to administer flu shots to seniors. Last February, Vilmar, our local visiting nurse, stopped by on his motorcycle with a small cooler containing flu vaccines and gave Gloria and I our flu shots right on our porch. Now, that’s service! 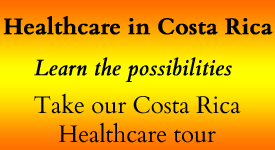 In Costa Rica, they bring healthcare to the people. If only the richest, most powerful country in the world would take some pointers from Costa Rica. How can a developing country make health care available to its residents and the U.S. can’t? This is a great thing for those who do not know better. But I mean that in Costa Rica for medical care should have standards. But this is not the case! When someone goes to a serious illness in a EBAIS in Costa Rica, he can not count on him always the best possible solutions are offered. The idea was good. Today fighting corruption and fraud to the CCSS. This however anyone seeking help in the country! You basically right, but everyone who visits Costa Rica or want to live here should also know that we in the 3rd World country living. I read the article in La Nacion. I would have paid the 8,000 colones for the helicopter transfer. This is why we recommend a mix of public and private health care when needed.